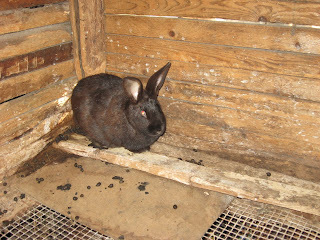 This is a mother rabbit. This is Silas, trying to get a look at the rabbit from any angle he can. 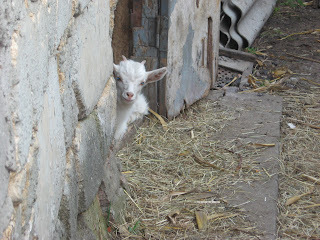 This is the goat, the girl-goat... trying to get a look at Silas. 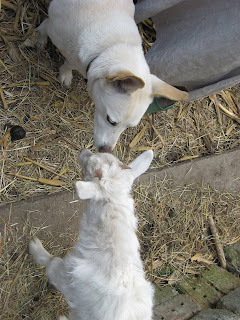 This is Silas and the goat, seeking to determine the nature of their relationship. 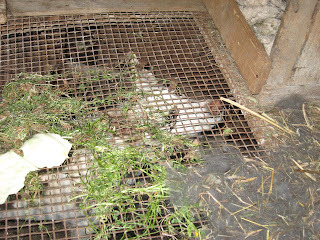 Posted by Barb at 11:39 p.m.
Great pictures, but I am sorry to say that my little goat-friend disapeared. Also we moved away from that house, so no rabbits anymore. Where we live now I can hear frogs, I haven't seen them yet, but maybe they will be fun.